Alston Graded School, one of the first schools for black children in Dorchester County, stood here from 1910 to 1953. Named for its founder, Dr. J. H. Alston, it included grades 1-11 until 1949, when grade 12 was added. In 1953 the two-story wood frame building was moved to Bryan Street and a new brick building was added. 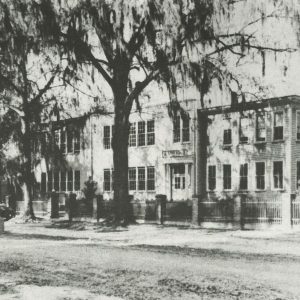 When all the county’s schools were desegregated in 1970, Alston High School was merged with Summerville High School, and the old Alston campus was replaced with a new middle school, also on Bryan Street, that still bears the historic name.